Where art and music are one in the same. All as it should be. Sometimes when I think about how much free time musicians have while they're on the road I become extremely jealous. Working in an office for nine hours a day doesn't allow lot of time to study, read, explore, or discover. It's true, a lot of the time artists spend on the road is filled up with interviews, practice, writing, and planning, but with even one extra hour of watching the world go by in a van, to me, could be sacred time. If I had that time, I imagine I would spend it similarly to Prince Rama—theorizing, thinking, learning and creating art and inspiring proclamations. Beyond just how to fill spare time, Prince Rama creates their manifestos as a means to explain a relationship with their fans, with the world, with music, with history, and with life and death in general. If you've heard of the band, you know they're eccentric, you know they're more than just musicians, and you know they dress "wild". If you're a fan of Prince Rama, you know that all of this: the mortal and immortal, physical and metaphysical, appearance and interpretation of the duo's existence is so much more. They're prophets of the Now Age, and everything they do is a mechanism to fulfill it. In her latest manifesto, Taraka Larson defines specifically the idea of the Xtreme Now, Speed Art, Post-modernism and the Flattening of the World, Spiritual Devouring, and so much more. As with any art form, this document exists as the viewer's interpretation of it. For me, this body of work explains how viewers' relationship to art has changed over time because of modern society's influence over it; I see zombie cannibalism as an explanation for the woes of modern dating, I see the caged unicorn as a representation of an artists' creativity being stifled by the idea of corporation, I see Hypraxis as the Twilight Zone - a strange place of timelessness and intersection where things don’t always make sense. So what does this have to do with live music and touring as a band? You don't necessarily need to read the Xtreme Now to understand my interview with Larson below, where we study how the document relates to being a touring artist, but you should. Even better, stop by Printed Matter in NYC tomorrow for Larson's lecture, browse Prince Rama's insanely cool website and spend hours expanding your brain. Even better-er? Go to a Prince Rama concert. The T.S. Eliot, Four Quartets quote speaks to the concept of time while traveling between cities on tour, to having to be selfless in a band, to having to, in ways, surrender yourself to keep your sanity. What are some prayers or observances of the Now Age that you practice to feel or embrace the present moment at all times during a tour? Honestly, when I am feeling unhinged on tour I have always looked to music to help put me back in the present moment. Pop music is my prayer, my spiritual discipline. A well crafted pop song is like a self-contained mantra, a portal into my own emotional mirror. If I am feeling like I don't remember who I am, I go on a walk by myself and listen to music, and slowly let the music take over my body, watching the world slowly melt into a blank canvas again and my limbs into flecks of paint. How is Prince Rama making a mark in history that is meaningful, whether temporary like a shadow or ever lasting like a selfie that can stay in a cloud for all of time? Is it possible to make anything meaningful any more? History isn't really about the marks being made, it is about the hand that chooses one mark to be significant over another. I think more important than making history is just to make something that feels special and honest to you-- if what you are doing is a true inner expression, you are no longer a part of history. You have entered into the space beyond it. 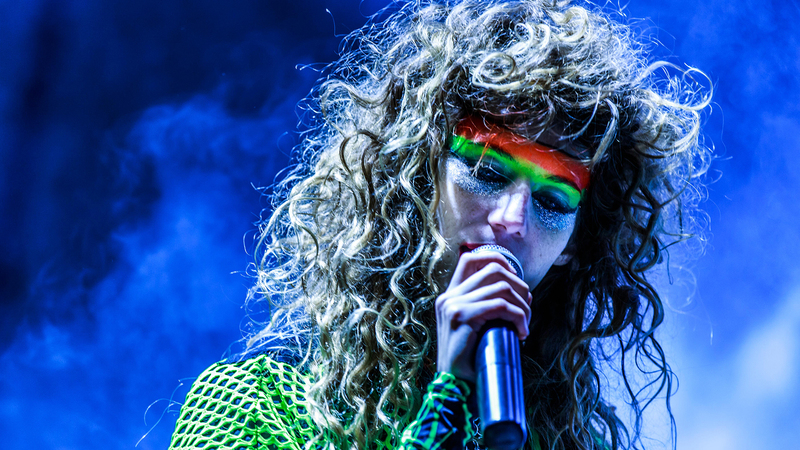 How does Prince Rama's live performance work toward ending the “flattening” of the world? To touch a feeling beyond just a basic concert experience, something beyond yourself, something that taps into a collective consciousness where you feel part and parcel of a sonic fabric beyond that of the space between your ears-- that is the un-flattening the world. The flatness comes from fear, from isolation, from vanity-- so many people go to shows these days purely for the onscreen experience-- to "check in" at this and such concert and tag selfies on social media. It isn't about an internalization of the experience at all. We want the music to devour you from the inside out. To lay spores inside your being and produce thoughts, feelings, emotions, imagery, and phosphenes that explode like the fruiting body of a mycelium network-- we want the music to be part of every fiber of your being and spill into everything you do. The kinetic motion of your feet muscles moving a certain way as you walk out of the concert should be a manifestation of the unflattening power of music. Or as TS Eliot eloquently states, "You are the music, while the music lasts..."
At your concerts, live music is existing as a museum and as the Xtreme Now manifested—a moment that is neither here nor there, but an active space within Utopia—concert-goers are existing as the key to the diamond portal of NOW, while simultaneously becoming the art within this museum. Since “all the world is a canvas, and the players become the artists themselves” what is some “art” you have seen these “keys” create during one of your performances that you truly appreciate? You know, I gotta say-- I feel so grateful to all our fans. I really do. Without them, the museum would just be vast empty halls. It is hard to think of one specific experience because I feel like every show I am totally blown away by everything that "happens" within the music. I love when spontaneous things occur that you could never plan. Sometimes I trust fall into the audience-- not really for the thrill of it, but for the wonderment of watching how the entire room transforms to react to this single gesture. It is like witnessing anarchy in action. Suddenly people's true natures come forward. Some people shield their hands over their faces in terror. Others dart out of the room, wanting nothing to do with it. Others who were pressed against the wall are suddenly galvanized to action and rush forward to catch me to make sure I don't get hurt. Some are worker types, just numbly crowd-surfing because it seems like the thing to do. Others become like leadership figures, dictating where to crowdsurf me and at what point I should be placed back onstage. It is endlessly fascinating, these micro-autonomous societies that coagulate for the brief duration of the show then disperse into total nothingness. Every show is like a snowflake. You will never have that combination of people there in that room at that moment in that time of their lives ever again. That is the most beautiful art. You define HYPRAXIS as “a re-connection of the current perceived dislocation between time and space and a joyful resurrection of the symbolic power of art and music by means of UTOPIA.” Later you anthropomorphize it by having it laugh at us for believing that earth and paradise, mortal and immortal, physical and metaphysical were separate realms. If you were to continue this idea and assign a music personality to HYPRAXIS, what actual person from music’s history would you say he/she/they can be most closely embodied by? I love the idea of experiencing the Xtreme Now through possession—experiencing a moment where music takes control of your body. Can you share a time when you personally felt possessed by music? Every time I play a show! How does your onstage presence (outfits and stage setup) play into Transubstantiation? We are the bread and the music is the divine force that devours us and turns us into its body and blood. Some people say "fashion" but we say "body and blood". What is someone who is a “fruiting body of your band’s network” expected to look like (you referenced punk subculture and how people within it dress and live a specific lifestyle). What is the physical outgrowth of the Prince Rama network? Ha-- nice question. You know-- it's a funny thing. More and more so over the years we have been noticing people showing up to our shows in full glitter and neon makeup and crazy patterned spandex clothes. I never really put it together that they were in fact "embodying" the Prince Rama spirit-- I just thought wow they look cool. Then it started getting a bit more literal. We played a show in Moscow where there was literally a Prince Rama "dress code" to get in (you had to wear glitter or something shiny). This year for Halloween we were playing a show and there was a couple who dressed as Prince Rama for Halloween. We couldn't believe it. They did such a good job that I thought they looked even MORE Prince Rama than we did. So yea, I guess this could be looked at as part of the physical outgrowth. It's really strange and flattering. My gut reaction is to start wearing no make up and super normal clothes to see if that influences the mycelium network. You will soon be performing at the Andy Warhol museum. In the Xtreme Now era, a musician’s sounds create an invisible context for art to happen. With a venue like this existing as a physical context, how will it influence the art produced within it and the canvas on which it will be produced versus performing at a classic concert hall? What's funny is that I think Andy Warhol had a similar approach to art-- he was very interested in art just "happening" without guiding or controlling it too much. And I would argue that by producing Velvet Underground he must have understood deep down somewhere this relationship between music and creating a "scene" or a "happening or an "environment" or "the invisible context" for art to occur. It's funny how many museums we have played in, yet when I graduated from art school they scoffed at me for bringing in an album of songs I made as a final sculpture project. The art world seems very schizophrenic in its relationship to music. We are playing the Warhol museum as an after-hours entertainment "event", not as a sculptural installation or something. Music is allowed in the museums, but only if the context in which it is presented is separated somehow from the "art". Velvet Underground concert tickets weren't being sold nearly as much as actual Warhol paintings, but I think this paradigm is slowly changing. I think it is still difficult for the art world to wrap their head around music as a veritable sculptural medium in and of itself-- much in the way Joseph Beuys giving lectures was a form of "social sculpture", shaping the thought patterns and emotions of those listening. Andy Warhol said the most important part of an artist or a work of art was its "aura" , which is totally in line with Xtreme Now. This is true in music as well-- You can listen to a million Elvis impersonators-- some of them are really good too-- and yet only Elvis has the Elvis aura. Museums have an aura. Concert halls have an aura. Museum auras are very distinct because they rely very much so on the smoke and mirrors of art as this sacred object that you must stand far away from and not ever ever touch. Sometimes shows at museums have this aura to it. That even though there is a concert going on, you can't get close to anyone or move too quickly or touch anything. Hopefully this will all be ripped to shreds. How does this manifesto differ from others you have published, and how can other artists use it as a “spiritual guide for tour survival”? "Spiritual Guide for Tour Survival"-- I like that. I think there are a lot more practical applications for day to day life in this manifesto than the earlier more theoretical ones. Actually more like day to day death. To tour successfully, I think one must die everyday. Every concert you must give all of yourself and be consumed completely, like a good bonfire. Embracing death is the only true way to live forever. And this book was written as a travel guide to immortality.